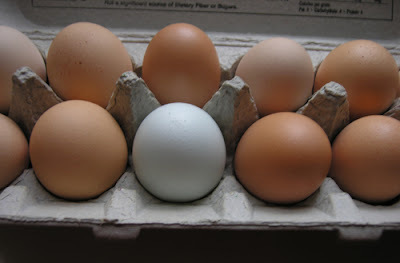 When I last stopped by Shady Maple Farms for fresh, right-out-of-the-hen eggs, Ms. Linda asked if I cared for a blue egg. Who could resist that offer? The egg is the offspring of a Blue Hen, who was abandoned injured at the county fair by some really bad actor of a 4-H kid. Ms. Linda and her husband, the vet, named the chicken Lucky, for good reason, and took her back to Shady Maple for recuperation and poultry companionship. The egg is not a brilliant, knock-your-socks-off blue but rather a sweet, light azure, and we are delaying cracking open such a lovely thing. When we do, it will be our lucky day. Did you crack it open yet? How wonderful to have such colorful neighbors.